Zadar town and the surrounding region are not as “discovered” as other areas in Croatia for tourism. One of the reasons may be that there are very few international flights to Zadar airport, especially out of season. All that might be about to change as there are strong rumours that Ryanair will soon be flying to Zadar – see our earlier posting. However Zadar is less than a two hour drive from Split Airport and the new motorway makes the trip very easy. It’s well worth it, whatever time of year you visit. The town itself was hit worse than most in Dalmatia, during the homeland war, but it’s recovered fast and the city centre is full of great history and architecture. It’s compact and cosmopolitan and there are a number of relatively new ventures that might help make it the “it” place to go in the near future. Add that to the sunsets that Alfred Hitchcock raved about, and the less developed islands of Ugljan and Pašman nearby, and you have a great base for a summer holiday or an out of season break. 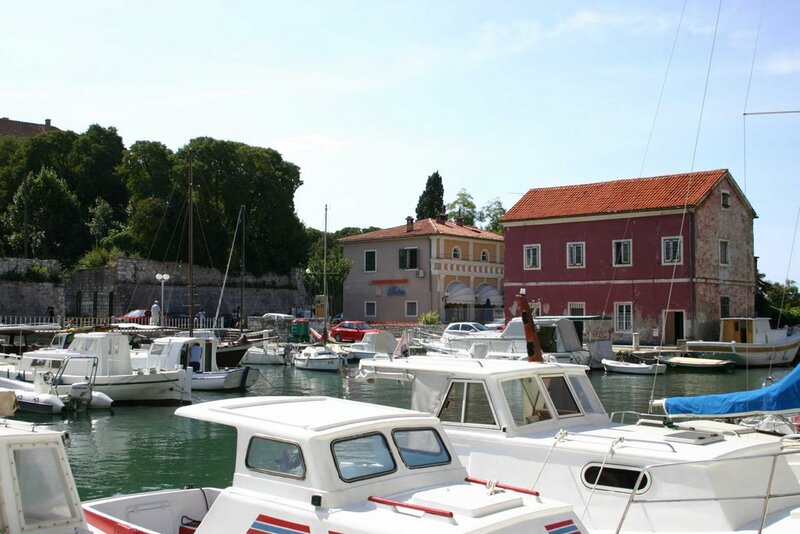 A half hour walk from Zadar is Borik where most of the large hotels are located. However, much closer to the centre of town is the charming Villa Hrešć, a family hotel with all the mod cons, a great restaurant, a swimming pool and a lovely view of the bay. It’s open all year round and if you’re looking for a winter break to discover the real Croatia, away from the madding crowds, then this could be the place for you. The authoritative Time Out Visitors Guide to Croatia reports as follows “The three storey Villa Hrešć contains two rooms and six roomy suites, more like condominiums, with a kitchenette, dining room and modern bathroom, all finely furnished. The larger ones have wide terraces, with a stunning sea view, the same line of vision as you swim in the outdoor pool with its fierce water jet in the corner. Patris runs a friendly ship with a pretty restaurant on the ground floor where the inclusive buffet breakfast is served.” For more information, have a look at their website http://www.villa-hresc.hr/ and if you decide to visit out of season, you may well be able to negotiate a great deal. And if you’re visiting Zadar between late May and early September, don’t miss the Garden, a Brit owned lounge bar and club featuring well known DJ’s throughout the season. It’s set high up in Zadar’s Venetian fortifications and has a huge terrace equipped with loungers where you can just relax during the day with a cocktail before the music gets started. The Garden’s team has plenty of other projects on the go too, with a successful summer music festival already under its belt. Check out http://www.thegardenzadar.com/ for the latest news. Zadar is also a great place to eat out with the road to Borik lined with good restaurants – Albin, Rocco, etc. Lungo Mare overlooking Draženica Bay has a great wine list as well as good food, and the more traditional Foša (see photo) is in a great location by the city walls and much better value for money than you might initially think. Kornat, by the ferry port is also well worth a try. If you’re travelling to Zadar by boat then you have a good choice of marinas – one very close to the city centre, one out in Borik, and a new one – Olive Island Marina, http://www.oliveislandmarina.com/ - just opposite, on Ugljan island. Finally, if you do decide on that out of season break in Zadar, you’re less than an hour’s drive from Šibenik, another undiscovered jewel in the Croatian crown. Go to our earlier postings for more information on Šibenik.